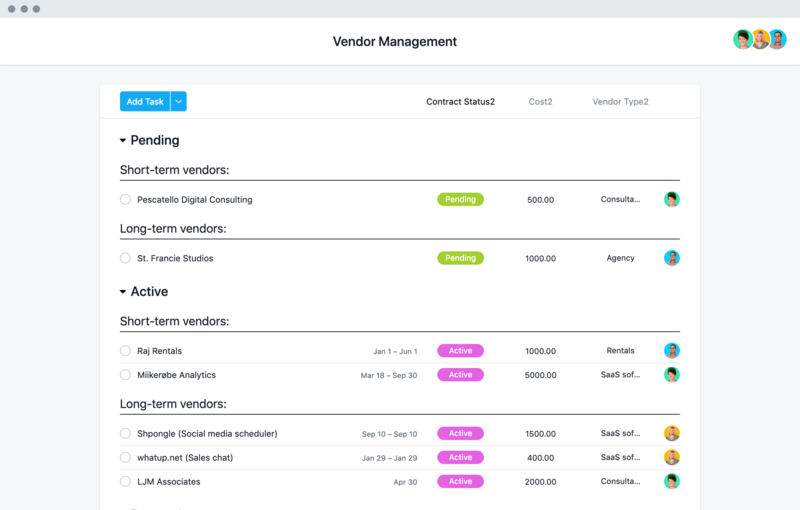 Manage relationships, track contracts and payments, and monitor delivery and performance across all your vendors and suppliers with our vendor management template. Scale repeatable processes. Standardize sourcing and evaluation criteria so you can select and onboard new vendors more quickly and schedule recurring tasks like check-ins and payments to spend less time coordinating. Centralize vendor information. Capture important details—contacts, pricing, documents, status, and meeting notes—in one place to give your team visibility on every vendor. Improve communication and accountability. You can assign actionable tasks to vendors and share updates and feedback in Asana for more accountability instead of communicating across long email threads with. How do you set your vendors and agencies up for success? Our onboarding tips explain how. Get tips on managing and tracking vendors from initial contract through the end of your engagement from our guide. Find out how Overstock manages over 200 supplier relationships in Asana. Read the case study. Get started with our vendor management template with a free trial of Premium today.